Michelangelo Antonioni's arty musing on the nature of film, set against a Swinging London backdrop, also features Vanessa Redgrave as the dead man's lover. Michelangelo Antonioni's arty musing on the nature of film, set against a Swinging London backdrop, also features Vanessa Redgrave as the dead man's lover. When fashion photographer Thomas (David Hemmings) develops the negatives of some film he has taken of an embracing couple in a park, he notices that there is a gunman lurking in the bushes behind them. Returning to the scene, he discovers the corpse of the male half of the couple, but, when he visits the site the following morning, the body has disappeared. 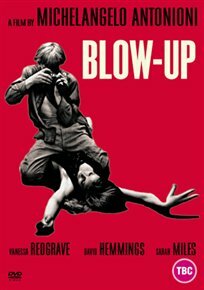 When fashion photographer Thomas (David Hemmings) develops the negatives of some film he has taken of an embracing couple in a park, he notices that there is a gunman lurking in the bushes behind them. Returning to the scene, he discovers the corpse of the male half of the couple, but, when he visits the site the following morning, the body has disappeared.